Malian singer seems to be doing things large even as the rest of the world is still skittish about poking its head out its shell to check if the recession is over. I mean, she released a solo desert blues album called Timbuktu Tarab last year, and now has released its rock counterpart, a collaboration with Brooklyn-based collective The Sway Machinery called The House of Friendly Ghosts, Volume 1. 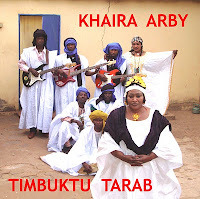 It says something that NPR dubbed Arby "Mali's Reigning Queen of Song." Maybe it says that NPR is ignorant of the work of Oumou Sangare. But Arby is arguably more active at present than Sangare, and with a back story and activist bent that may equal that of "The Songbird of Mali." Songs on her solo album speak out against female circumcision, against war, and for women's rights. IN "Wayidou" she asks the musical question: "Why in a country of beautiful women do men go to war?" A little while back, I gave you a preview of the collaboration with The Sway Machinery. So here's a track from her album without the Jewish cantorial rock element to entice you to catch one of the last few shows on her current USA tour if you're in the right place at the right time (March 15 in Denver, March 17 & 19 in Austin). The sparkling explanation I received for this rockin' track is: "I am your servant and my job is to spread joy around the world with song. I am proud to be your servant of happiness." listen/buy The House of Friendly Ghosts, Volume 1. This is very energetic! Going a bit in the direction of Tinariwen. I agree with you that she can't be compared to Oumou Sangare, they really are quite different. I'll check out the Sway Machinery link.